Luzerne County is the most populous county in the NEPA PREP Region. Major cities include Wilkes-Barre and Hazleton. The County benefits from an excellent transportation network including Interstates 80, 81 and 476. Significant residential and business development parallels the I-81 Corridor. Rail service includes the Canada-Pacific Railway, Norfolk Southern, Reading Blue Mountain and the Northern Railroad. Passenger and cargo jet service is available at the Wilkes-Barre/Scranton International Airport. There are also smaller airports at several locations in Luzerne County in the Greater Hazleton and Wyoming Valley areas. Luzerne County is home to six college and universities offering two and four year degrees as well as masters and doctoral level degrees. The economy of Luzerne County is diversified with employment concentrated in manufacturing, logistics, health care and other service / retail business sectors. Significant downtown redevelopment projects have occurred in the cities of Wilkes-Barre, Hazleton and Pittston. Luzerne County has numerous options for entertainment. The spectator sports enthusiast can see horse racing at Mohegan Sun Pocono. The Wilkes-Barre/Scranton Penguins, an American Hockey League affiliate of the National Hockey League Pittsburgh Penguins, and dirt-bike racing can be seen at Mohegan Sun Arena at Casey Plaza in Wilkes-Barre. Performing arts can be seen at several venues including the Kirby Center for the Performing Arts in Wilkes-Barre and the Ferraro Performing Arts Center in Hazleton. The gaming industry is in the Northeastern Pennsylvania region with Mohegan Sun Pocono in the Wilkes-Barre area of Luzerne County. Gaming facilities contribute to the regional economy and provide investment dollars to counties and municipalities. Luzerne County has many well developed business and industrial parks located in the Greater Hazleton, Wilkes-Barre and Pittston areas. These parks are mainly located in very close proximity to interstate highways. 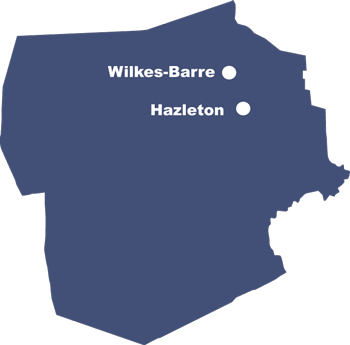 Luzerne County is located in the Scranton-Wilkes-Barre-Hazleton MSA. 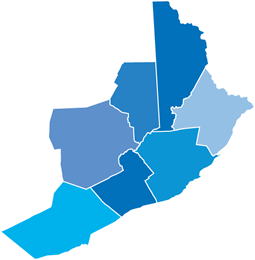 Incubator facilities can also be found in the Hazleton and Wilkes-Barre areas which are connected to and sponsored by local economic development organizations.